Last month, one of our Account Managers, Karen, took two weeks off to travel to beautiful Honolulu, Hawaii. 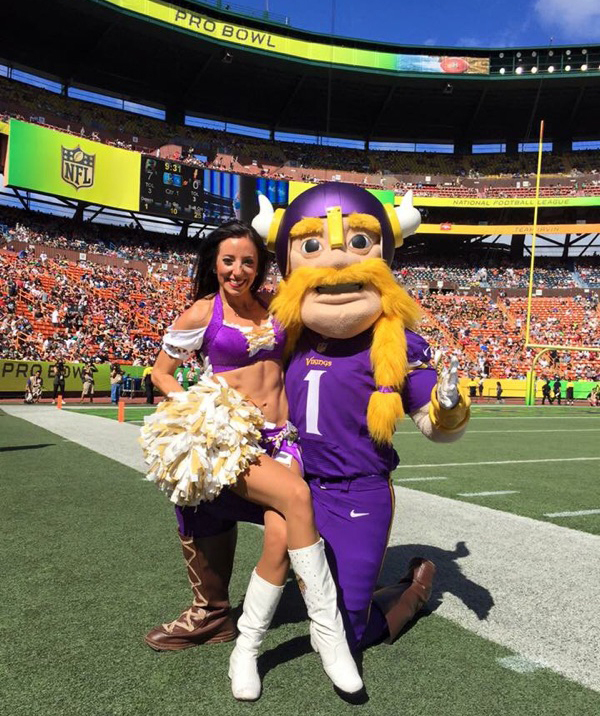 This was no ordinary beach vacation though - Karen traveled to this exotic local to represent the Minnesota Vikings as their 2016 Pro-Bowl Cheerleader! What an honor! Did you know that The Line Up is proud to call THREE current and former employees Pro-Bowl Alumni? Our Marketing Coordinator Pam and former Account Manager Laura were also chosen to represent the Vikings. We’re constantly impressed with committed and hard working ladies at the Vikings organization, and Karen is no exception. In addition to managing your accounts at her full time job at The Line Up, Karen has also danced for the Vikings the past 6 years (3 years as a captain), and is the strength coach for Edina High School Dance Team. In preparation for the big event, we had to be sure to send Karen off in style. She designed 6 new outfits and a jacket with our Vikings design team, made especially for her to represent her team. She debuted those styles at her sendoff - where she performed (solo!) the Pro Bowl dances she learned in front of her teammates, friends, and alumni! While in Hawaii, Karen had a busy week-long schedule. Along with the other Pro Bowl Cheerleaders, she made various appearances in the community, in addition to performing at the game. Activities including hosting an NFL Play 60 event to promote physical activity with elementary students, and dancing up to 6 times in one day (!) at the Pro Bowl Beach Stadium - a pep-rally of sorts - for hundreds of public beach-goers on Waikiki Beach. What's it like to be selected? Being selected for the 2016 Pro Bowl was a dream come true! 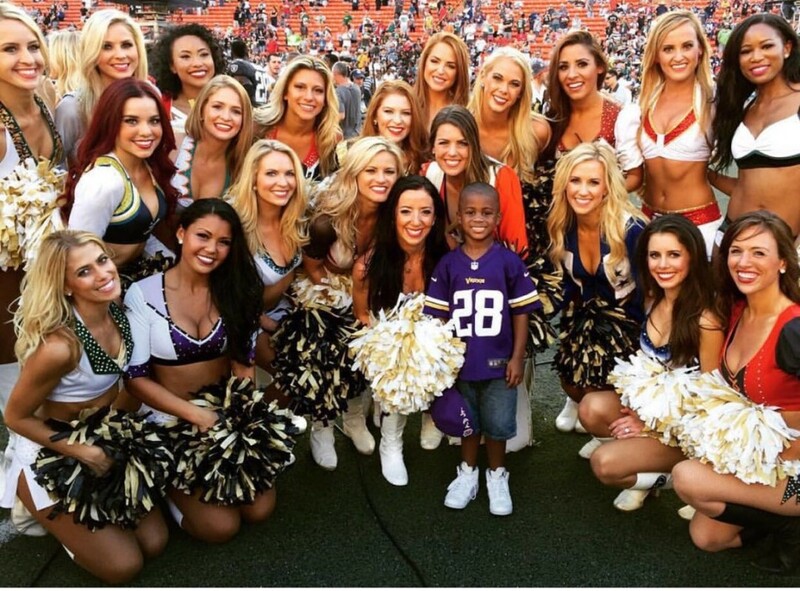 Representing the Minnesota Vikings Cheerleaders and the Minnesota Vikings was incredible. Any one of my teammates would have represented so well, and I am incredibly honored that I was the lucky one chosen. Preparing for the Pro Bowl was a lot of work, but also my favorite kind of work! I made sure to get in my normal workouts and to get plenty of sleep. I was also given several routines to learn via video, that I was expected to know when I arrived in Hawaii. My current teammates and former MVC Pro Bowl sisters were able to help me so much with perfecting and practicing the routines. What did you wear? What was your favorite outfit? I was able to perform all of my routines for the 2016 MVC in my new practice attire from The Line Up! Everyone loved the new styles that the Line Up team and I came up with. If I had to choose a favorite it would be the white throwback jersey mesh top with Minnesota on the front, and a big Norseman on the back that was encrusted in rhinestones [pictured above]. I received so many compliments on it and it was so comfortable. There were so many amazing experiences from the Pro Bowl, but some of my most memorable experiences of the 2016 Pro Bowl was dancing the Pre-Game show with singer Rachel Platten, and taking the official team picture. The whole week was an experience I will never forget!